What Are the Symptoms of Morphine Allergy? Morphine is a sedative used to treat pain. 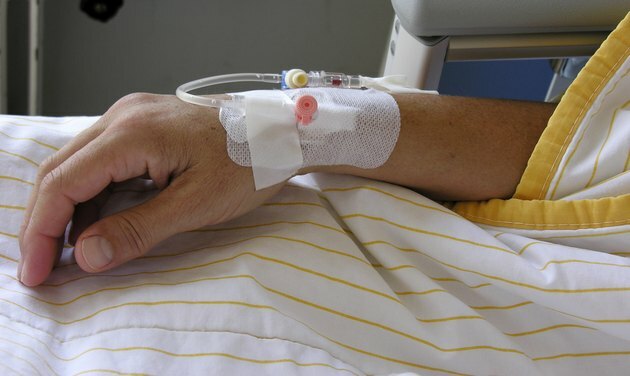 Often an adverse response to morphine will be due to something other than an immune reaction. True allergies to morphine are rare, but when they do occur, it can be life-threatening. Seek immediate attention if you suspect you are having an allergic reaction to this medication. Allergic dermatitis occurs when an allergic reaction causes a skin rash. These rashes can assume a variety of forms, from hives to blisters. People who suspect that their skin rash is related to morphine allergy can be given a diagnostic patch test to confirm whether morphine is indeed the cause of their symptoms. The runny nose and watery eyes of hay fever also occur with morphine allergy. This is caused by the release of histamines by the immune system in response to exposure to an allergen. Histamine increases permeability of blood vessel walls, allowing fluids and white blood cells to flow into surrounding tissues. The itchy, uncomfortable symptoms of nasal congestion are related to this histamine-regulated response. Doctors will sometimes avoid prescribing morphine because it has the potential to prompt bronchospasm. This symptom occurs when the muscles in the airways of the lungs constrict, impeding the flow of air. Breathing is difficult for a person who is experiencing bronchospasm. Anaphylaxis is one of the signs that a true allergy to morphine is occurring. Anaphylaxis is an allergic reaction that affects the whole body. It is characterized by a rapid onset of symptoms that include slurred speech, difficulty breathing or swallowing, anxiety and confusion, palpitations and fainting or light-headedness. Anaphylaxis is a serious, life-threatening condition and anyone who is suspected of having an anaphylactic reaction should receive immediate medical care.